As if there was any need to demonstrate the vacuous nature of most of the Fourth Estate, here we are in the run-up to a General Election campaign, there is conflict across the Middle East and in Ukraine, the Eurozone still has not resolved the dispute over Greece’s debt repayments, over in the USA Hil is having a little local difficulty of her own, but across the front pages today is … Jeremy Clarkson. Wait, what? “Jeremy Clarkson suspended by BBC: Top Gear episode cancelled following 'fracas' with producer” reported the Independent. Fracas? Was that as bad, or worse, than a dust-up? Was it a bit whee, a bit whoa? Did it get a bit tasty? Was it merely handbags, or did it involve the old Ground Force scenario (decking)? Whatever it was, the next edition of Top Gear would not be broadcast. Then the story began to emerge. Radio Times told “The three remaining episodes of Top Gear series 22 have been pulled from the schedules after Jeremy Clarkson was accused of punching a producer. The Top Gear host has been suspended from the BBC after allegedly hitting a male producer, in an incident last week. 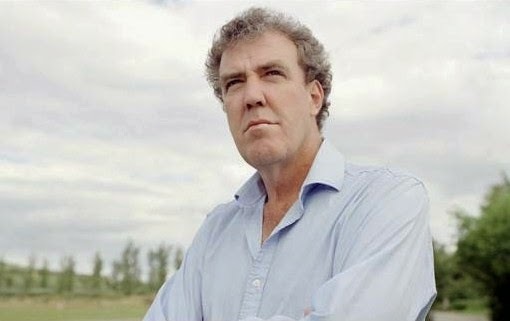 The alleged assault was only reported to the corporation yesterday, and BBC executives took the decision to suspend Clarkson earlier today”. So Jezza is alleged to have done a Piers Morgan retrospective on someone. And the Mail was by now on the case: “Jeremy Clarkson has been suspended and his future as Top Gear host is in doubt after he allegedly 'snapped' and punched a producer because of a lack of food on set, it was revealed today … The 54-year-old millionaire is being investigated by the BBC for allegedly 'smacking' Oisin Tymon, 36, in the face during a row over his dinner while filming on location in Newcastle”. Er, hello? Hasn’t Jezza got quite enough bellies as it is? And doesn’t this “man of the people” have sufficient nous to jump in his motah and pile off to the nearest eatery if he’s hungry? Or does Young Dave and Rebekah’s pal have to have a chap to do that sort of thing for him? And anyway, who cares? Yes, there is a petition on the go to bring Jezza back. There are rumours that ITV will lure him away from the Beeb with a big money offer, which might not be wise, given the last blokey presenter they poached was Adrian Chiles, which worked out well for his bank balance, but not for the broadcaster. And on top of all that, performing an act of assault on a work colleague is, for ordinary mortals, an instant dismissal offence. As far as is known, the BBC has the controlling stake in the Top Gear franchise. Director General Tony Hall has signed off on Clarkson’s suspension. The presenter’s efforts outside Top Gear haven’t been a spectacular success. There are plenty of candidates to replace him - all of them at least as telegenic, and younger. Jezza is already on his allegedly last and final warning. And he’s had a good innings. The age of Jeremy Clarkson at Top Gear was for a time, but, it seems, not for all time. Doesnt an assault usually result in a visit from the boys in blue? A nation waits. Amusing to see people who bang on about "living in the real world" suggesting Clarkson should be reinstated - maybe this sort of thing happens in newsrooms but not in real world offices. The BBC will have to follow the law on this, if he's punched someone then he's lucky to not have to answer charges. As for the lefties being after him, cobblers. He's done very well under the BBC, no one else would have had his back through all these gaffes, advertisers on any commercial station would have long avoided the toxic brand. His talk show was crap, sub Littlejohn man of the people rubbish, didn't wash years ago, won't wash now. If he has genuinely messed up, then discipline him/fire him as required by the nature of the transgression - of which we actually don't know a great deal other than rumour. However, I'm uneasy about the undisguised glee in some quarters about his suspension. I'm a leftie, but I enjoy Top Gear for what it is. I also get fed up with the assumption that if I don't hate him by default I must be a fraud in everything else I stand for. The thing is, he's a pantomime villain. he has no real power, and makes no secret of knowing he's a buffoon who shouldn't be taken seriously. He's not IDS or Cameron, making decisions that genuinely ruin lives claiming they really are doing it for the best, or even Boris with his bumbling act disguising a genuinely nasty piece of work. Getting him off the BBC will only do three things: deprive the BBC of a lot of income/audience, give ammo to the enemies of the BBC who say it's now only for lefties, and strengthen whatever one of the rival broadcasters pick up Top Gear. The rejoicing in getting shot of someone that the people who disliked him probably never watched anyway might end up being short-lived if it harms one of the few remaining media sources in the UK not owned by Murdoch and chums. I think it's a case of be careful what you wish for. It'd probably be far better long term to have Clarkson stay put but be reprimanded than for the BBC to bow to pressure to fire him regardless of the actual incident (assuming it doesn't automatically warrant it). Agree with annon 4 - pretty sure Top Gears profits pay for BBC4 and as much as Stuart Lee hates it, probably for much of the minority appeal comedy the BBC puts out, still reckon it's cobblers the lefties have been after him as they've clearly been terrified of letting him go. Time to throw Clarkson off the gravy train. Jonathan Ross and Russell Brand were hounded out of the beeb for far less. Top Gear has managed perfectly well without him in the past and I see no reason why it could not do so again. Although there is no doubt he commands a cult following (had to be VERY careful with the spellchecker there) he antagonises far more folk tham he attracts. A repugnant mix of Flashman, Peter Pan, and the Bullingdon Club, Clarkson rivals Murdoch stablemate K***e H*****s for the dishonour of most odious figure in current public life. The sooner he disappears from the airwaves - hopefully never to return - the better! Guy Martin's agent is, I imagine, wetting himself with excitement at this moment. What's really worrying isn't Clarkson at all. It's modern Britain. The best part of 200,000 people signed the petition before any details of what had actually happened were released. We've reached the point where slebs can do anything and there will be a chearing mob to support them. As for the man, he has done some good stuff outside of Top Gear - but not recently. His programmes on Brunel and VCs were worthy of showing in high schools as lessons. His 2002 Tour of Europe was surprisingly good and would have got the right wingers a bit upset. And in that tour his report of a Basque village they'd stumbled upon in the aftermath of an ETA murder was the sort of thing full time news reporters get awards for. It seems that world fame has pushed him over the edge in the last decade, and that's a pity.